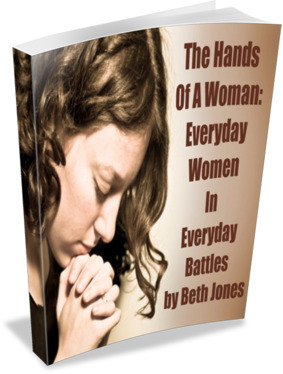 This week I am interviewing the contributing writers for my newest ebook, The Hands Of A Woman: Everyday Women In Everyday Battles. Yesterday’s interview with seminar speaker and author Jane VanOsdol went great, and I’m excited about tomorrow’s interviews with seminar speaker/author Susan Evans of SusanEvans.org and seminar speaker/author Mary Kane of OnlyByPrayer.com. Susan’s interview will be at 12 p.m. Central Time (CST) and Mary’s will be at 3 p.m. Central Time (CST). Be sure to tune in to “Meet The Authors” of this powerful ebook. Click here to hear the interviews at Talkshoe, or you can listen on the player below. If you have not bought your copy yet, you can still get the 25% special discount on the price of the ebook right now. The stories in this ebook are powerful and moving, such as women going through marriage problems, women suffering with anxiety attacks and severe depression, a family whose baby passed away at one week old, women who were victims of childhood sexual, physical, and domestic abuse, and more. It would make a great gift for a family member, friend, co-worker, or someone else you know who’s going through a hard time and needs inspiration and encouragement that they can get through it and have victory in Christ. Click here to find out more info about the ebook.